On Thursday, October 18, over 20 girls and their families gathered at the Porter County Community Foundation for the inaugural Girls’ Giving Fund Grant Celebration to award their first-ever grant to a local nonprofit. Members of the Girls’ Giving Fund awarded their first-ever grant to the Porter County Parks Department at their inaugural grant celebration event. The Girls’ Giving Fund is a newly established giving circle with the Porter County Community Foundation, made up of 7 to 13 year old girls from all over Porter County. The circle was launched in the spring of 2018 to empower young givers with the knowledge that they can make a difference in our community and allow this new generation to experience the joy of giving. Twenty-six girls each raised at least $100, collectively bringing in $3,000. Thanks to the generosity of a local donor, $1,000 was added to their total, allowing the girls to award a $4,000 grant that evening. The first-ever Girls’ Giving Fund grant was awarded to the Porter County Parks Department. The other finalists, Memorial Opera House and Our Greater Good, each received a $500 grant. In addition, two local donors each gave $1,000 to start the Girls’ Giving Fund Endowment, ensuring the girls can continue to make a difference in Porter County forever. “It’s really encouraging to see kids get excited about giving and the impact it has on our community,” said Bill Higbie, President and CEO of the Porter County Community Foundation. “Each one of these 26 girls did something creative to raise $100. Collectively, they were able to make a significant gift to the Porter County Parks which benefits countless people from all over our community”. If you know of a young woman who is interested in participating in the Girls’ Giving Fund, please click here for more information. Porter County Farmers are invited to attend the Gift of Grain Chili Day at the Co-Alliance Elevator in Malden on Friday, October 19, 2018 from 10 AM – 2 PM. Gift of Grain Committee Members (left to right) Tim Stoner, Brad Metzger, Jane Maxwell, and Joe Cannon. A free homemade chili lunch and sweets will be served. Information about how farmers can support our community through the Gift of Grain program will also be available. The Gift of Grain program was started in 2017 as a way for local farmers to use grain to help families in Porter County start saving for their kids’ college education. The program supports Promise Porter County, an initiative that helps families with first grade students invest in a CollegeChoice 529 savings account. Gift of Grain is also investing in a permanently endowed fund. The Agricultural Community Initiative Fund, at the Porter County Community Foundation, will help ensure there will be resources available to meet future needs in our community. While chili will be available on October 19, gifts of grain can be made anytime. This is an ongoing project that encourages farmers to participate at the time of year that is best for them. A gift of grain can be an easy, tax-efficient way to support local causes in our community. For more information about the Gift of Grain program, visit www.pccf.gives/giftofgrain. In the event of rain, the Gift of Grain Chili Day will be on Friday, October 26. The 18th Annual Women’s Tea took place on Friday, September 14. Over 200 women of all ages gathered together for lunch to support the Women’s Fund of Porter County. This year’s guest speaker was Sarah Harmeyer, Founder and Chief People Gatherer of Neighbor’s Table. 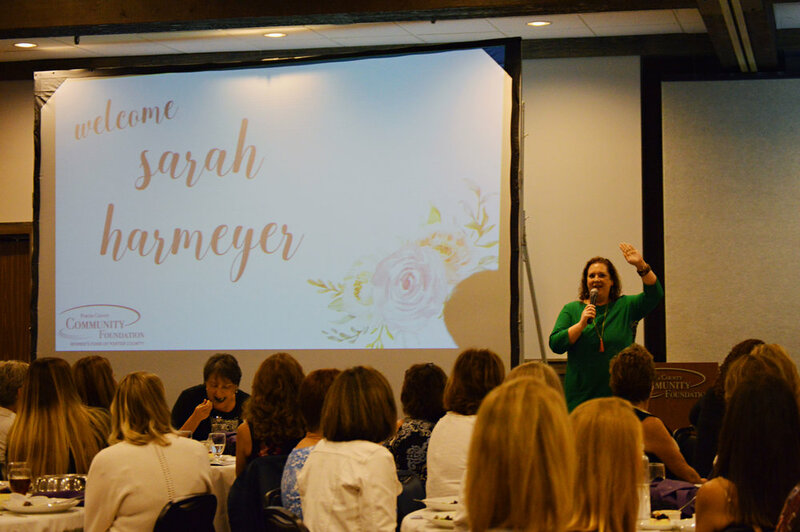 Sarah Harmeyer, Chief People Gatherer at Neighbor’s Table, was the guest speaker at the 18th Annual Women’s Tea to support the Women’s Fund of Porter County. In 2010, Sarah asked her father to build her a big farm-house style table that she put in her backyard in Dallas, Texas. She hung chandeliers from the oak tree above and invited her neighbors to dinner. That first night, 91 people showed up. The simple idea of inviting a neighbor to share a meal turned into something extraordinary. Sarah has now had over 3,000 people sit at the very table her father built for her years ago, joining together in laughter, conversation, connections and love. While Sarah continues to invite people to her table, her dad now builds tables for people all over the country. They have personally delivered tables to 29 states, with a goal of having a “Neighbor’s Table” in every state by 2020. Sarah spoke about the importance of being intentional. She challenged the ladies in attendance to invite people to gather together. With a simple act of inviting strangers to gather around the table, you never know what might happen. “Community is important” said Sarah Harmeyer, “A community changes when we are intentional about what we do.” With her father serving as “Chairman of the Boards”, the official table-maker, and Sarah serving as Chief People Gatherer, they have created a movement of connecting people and communities. The Women's Fund of Porter County offers an opportunity for women to collectively share in the joy of giving. Women from all backgrounds come together with one common goal in mind - improve the lives of women and children in our community. With the goal of raising $100,000 annually, $50,000 is awarded in two high-impact grants while the remainder is permanently endowed in the Women’s Fund at the Porter County Community Foundation. Since 2007, The Women's Fund has awarded over $550,000 in grants and holds over $917,000 in the endowment fund, ensuring that the positive impact will continue on forever. As one chapter comes to a close, a new one is just beginning for the 27 talented high school seniors recognized at the Porter County Community Foundation’s Annual Scholarship Banquet. Since 1998, the Foundation has presented 356 scholarships to Porter County students. The Porter County Community Foundation has awarded 82 Lilly Endowment Community Scholarships to Porter County students since 1998. This scholarship pays full tuition and fees to any college or university in the state of Indiana and $900 each year for books. The 2018 recipients of the Lilly Endowment Community Scholarships are: (left to right) Alaynah Chatman (Portage High School), Robert Walker (Washington Township High School), and Abigail Koster (Chesterton High School). Porter County is fortunate to have businesses and individuals who value the importance of education. Thanks to the generosity of NIPSCO, the Plesac Family Scholarship Fund, the Larry and Jerilyn Klemz Scholarship Fund, the Largura Family Scholarship Fund and the Tom and Alice Roberts Scholarship Fund, a $1,000 scholarship was awarded to each of the following recipients: (left to right) Jayson Heinold (Kouts High School), Austyn Pryatel (Morgan Township High School), Natalie Dowdy (Andrean High School), Sam Klumpe (Valparaiso High School), Emily Horsley (LaCrosse High School), and Mickayla Edmaiston (Portage High School). Not pictured: Kayla Rivera (Wheeler High School) and Thomas Gotsch (Marquette High School). The Chesterton High School Class of 1958 established the Harlan A. Siegsmund Liberty Township Alumni Scholarship in honor of their longtime principal. The scholarship is awarded to a graduate of Chesterton High School with a preference given to residents of Liberty Township. This year’s recipient is Rigoberto Alvarez, Jr. (Chesterton High School) pictured here with Ed Seykowski, a member of the class, who was instrumental in creating this scholarship. Each year, the Porter County Community Foundation provides $4,000 scholarships to Porter County students. The 2018 recipients are: (left to right) Madison Nondorf (Valparaiso High School) and Lexi Sroka (Hebron High School). Not pictured: Alex Reed (Boone Grove High School). The Foundation and the Porter County Career and Technical Education Center have worked together since 2008 to award scholarships to their students. The recipients for 2018 are: (left to right) Joshua Chew, Cailee Hodges, Jacob Wells, Cameron Chapman and Abigail Vargas, with Jon Groth (Director of the Porter County Career and Technical Education Center). Not Pictured: Bridget McGrath and Tyler Smolar. Georgia Bricker, whose husband, Tom, passed away in 2006, established a scholarship in memory of him. This year’s recipient is Kelsey Fleming (Washington Township High School). Shawn Moyer was a 1999 recipient of the Lilly Endowment Community Scholarship. During his sophomore year at Taylor University, Shawn lost his battle with cancer. The remaining balance of his scholarship was endowed to create this award for Kouts High School graduates. This year’s recipient, Hannah Maier (Kouts High School), is pictured here with Nick and Bev Moyer, Shawn’s parents. College may seem far away to first graders and their families, but this fall, Porter County will bring post-secondary education and careers front of mind through a collaborative effort called “The Promise.” The program makes educational savings a reality by helping families start a CollegeChoice 529 Direct Savings account through their school, seeding the account with an initial investment from a local sponsor, and engaging the community to match deposits that the students, families, and champions all contribute to the account. Porter County is honored to be one of four new communities to launch the Promise program, with the support of Promise Indiana and the Indiana Education Savings Authority. Bob Wanek, CEO of the Valparaiso Family YMCA, and Bill Higbie, CEO of the Porter County Community Foundation, have led the local effort to bring “The Promise” to Porter County. During school registration, The Promise helps families take that first step to start saving, while also integrating college and career discovery activities in the classroom. Pilot counties select a cohort of students to participate, based on community size. The Promise Porter County Steering Committee consisting of local partners including school districts, the community foundation, local businesses and government, economic development groups, and nonprofits, has selected all first graders in the seven county school corporations for the launch. The generous support of Urschel Laboratories will make it possible for every first grade student to begin the school year with their own college savings account. There will also be an opportunity for those enrolled to invite champions—friends, family members, neighbors, coaches, and teachers—to invest in their college savings accounts. A coalition of local partners, including 1st Source Bank, Stewart and Kathryn McMillan, Thorgren Tool and Molding, Porter Health Care System, and the Porter County Community Foundation, will provide a matching deposit to the student’s college savings account during a prescribed period of time. Youth in the program not only build assets for post-secondary education and learn about college and careers, but they also visit a college campus for a day of interactive learning and dynamic hands-on experiences called “Walk Into My Future.” Valparaiso University will host the event this fall, with college students and faculty leading campus tours and activity stations for elementary-aged youth. Research from the Center on Assets, Education, and Inclusion at the University of Kansas shows that youth with a college savings account in their name are between three and four and half times more likely to go to college than those without an account. CollegeChoice 529 Direct Savings accounts can be used at any eligible institution—2-year community colleges, 4-year colleges and universities, even trade and technical schools. To date, over 10,000 youth around the state have started a CollegeChoice 529 direct savings account through the Promise program. To learn more visit www.PromiseIndiana.org. To get involved with Promise Porter County, contact Julie Giorgi at jgiorgi@valpoymca.org or 219-462-4185 ext. 267.